If you are seeing this you may need to upgrade your flash plugin. LL dresses in The Finest! 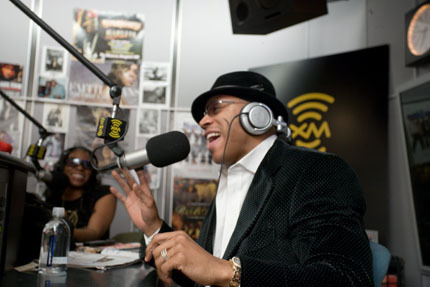 For this assignment, the objective was to capture LL Cool J’s second on-air visit. I had previously made a similar image the first time, but on this visit, he was wearing much more casual clothes, and his visit today was, in part, to promote a new CD as well as his new clothing line. The objective was to depict the celebration of Abraham Lincoln, as a part of events being held by the Lincoln BiCentential Commission. 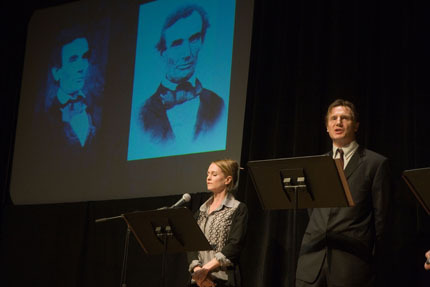 Each year leading up to Lincoln’s BiCentenial, noted actors would come to the Library of Congress to read the writings of Lincoln, and his wife. The challenge was to depict this visually, when the subjects are standing at podiums which hold the written words, on a stage that has a black background and single images projected on a screen. The Assignment Construct is a commentary about what went into, what went on behind-the-scenes, or otherwise occured before, during, or after an assignment. Everything from images of the setup, to choices of camera angle, client requests (and fulfillment), and so on. © 2006-2007 Assignment Construct. All Rights Reserved.